Protect against attacks exploiting gaps in application security. Identifying every possible gap in web and mobile applications requires advanced solutions. As applications grow, new functions added, changes made - the opportunity for new security gaps increase. To protect against security vulnerabilities in applications organizations need a comprehensive testing approach - to test the entire portfolio and verify security compliance. This has to happen early, and continuously to prevent against the threat of new attacks. In most companies, attacks occur at the application layer, and this is often not managed well. While most organizations agree that application is essential, it is also not done well or throughout the application lifecycle. 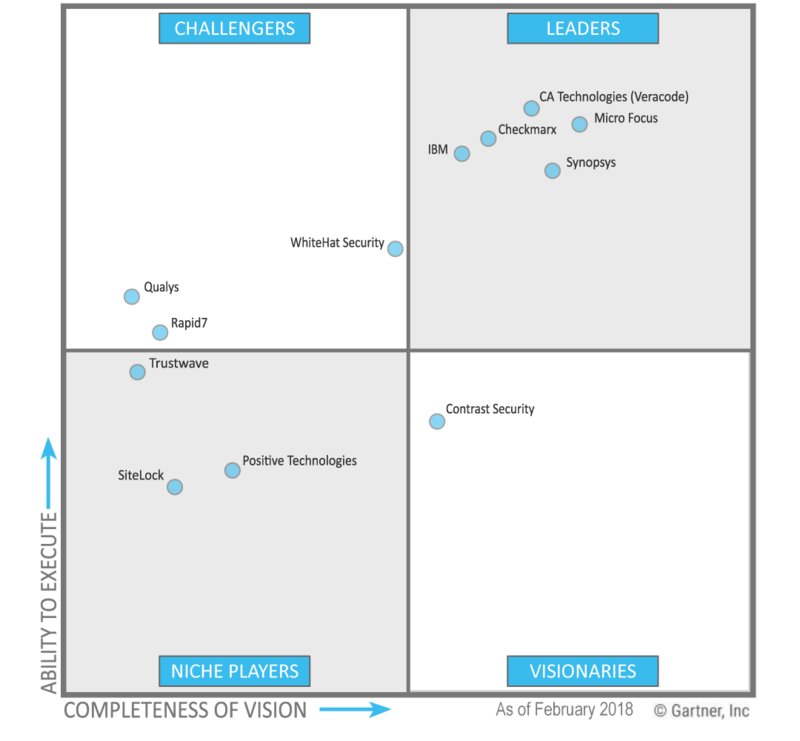 "HP, IBM, and Veracode Lead in application security ….."
Alacrinet provides a full set of solutions for application security to help organizations protect against this vulnerable layer of IT. We work with organizations to provide application security testing to protect web and mobile applications from threats. We provide the tools and support to help organizations close this critical security gap. IBM Security AppScan enables you to safeguard apps with static and dynamic security testing throughout the entire application lifecycle. Using Appscan can enhance web and mobile application security, improve application security program management and strengthen regulatory compliance. Micro Focus Fortify offers end-to-end application security solutions across the entire software development lifecycle for on-premise and on-demand solutions. The Fortify suite can be naturally integrated into the SDLS workflow and uses open APIs to embed application security testing into all stages of software development. CA Technologies (Veracode) can help you find vulnerabilities and detect and block attacks across development testing and production. Veracode offers holistic, scalable way to manage security risk across your entire application portfolio. Veracode offers a wide range of security testing and threat mitigation techniques, hosted on a central platform, providing full visibility into your risk posture. 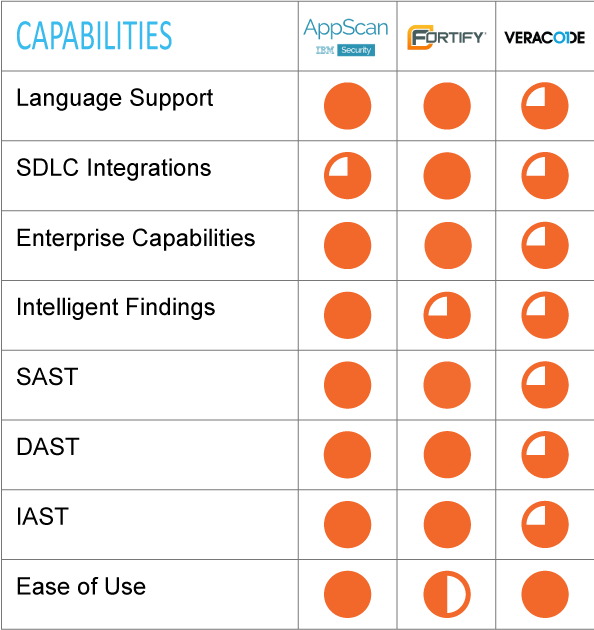 Veracode provides testing solutions covering all major languages, frameworks, and applications types, whether developed in house or purchased. Checkmarx has a strong reputation for its SAST solutions that support a broad variety of programming languages and frameworks, scalability and quick turnaround times via incremental and parallel tests. And with their acquisition and integration of Codebashing, Checkmarx is able to deliver innovative, gamified training modules as an in-workflow developer education platform for secure coding training. Legend: The chart above reflects a compilation of 3rd party analysis of strengths and weaknesses of each solution. Count on us to understand your needs and deliver the best solution for your environment. Get your security readiness assessment with a local expert today. Hmm, it looks like something went wrong while trying to submit your form. Please check all fields and try again.